Heath Ledger (may he R.I.P.) gave an outstanding performance as Gabriel Martin, Benjamin Martin’s oldest son, who enlists early into the Continental army. The story weaves fiction with fact as General Cornwallis takes South Carolina and local militias are called up to fight. Tom Wilkinson plays a convincingly arrogant Cornwallis, while Peter Woodward is great as his always-complimentary sidekick, General O’Hara. The “bad-guy-loudly-boo” award goes to Jason Isaacs who portrays British Col. Tavington, a ruthless Dragoons cavalry officer who employs extremely ‘ungentlemanly’ tactics. There’s a love story (2, actually), family values (Benjamin is a widower with SEVEN children), faith (Rene Auberjonois as Pastor Oliver, “sometimes a shepherd has to fight off the wolves”), a wedding, lots of historical settings…and a bit of violence (this is a Mel Gibson movie, after all) including the cannonball-off-with-his-head & gory ‘hack-a-soldier-to-bits-with-tomahawk scenes. Rated R – not for children – but this is one of the few ‘R’ movies (in my opinion) that has an extremely high inspiration factor. This entry was posted in MOVIES ! 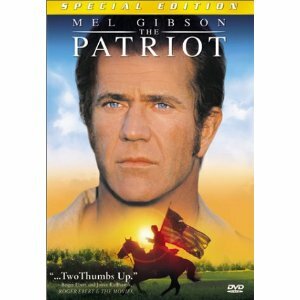 !, Uncategorized and tagged 4th of July, Action movies, America, American Independence, entertainment, Mel Gibson, politics, The American Revolution, The Patriot, The Patriot movie. Bookmark the permalink. Congratulations on your “blog birthday,” Virginia! May you continue to write and share your many good thoughts and observations for years to come. Yes Viginia!!. Allways, we will Stay the Course. Thankyou for the remainder.